For me the dungeon crawler is the spiritual core of gaming. My very first proper game was Heroquest and since then the concept of fantasy adventurers exploring goblin infested underground lairs has held something of a special place for me. It’s because of that reason that I invested in The Legends of Drizzt. I was looking forward to some co-operative dungeon crawling with friends around the table and reacquainting myself with some old friends from R A Salvatore’s novels. Unfortunately I was left disappointed with a game that just lacked any kind of substance. The Legends of Drizzt is a pretty game, there’s no doubt in that. It’s a giant box crammed with board tiles, miniatures and cards, you certainly get enough junk for your money. 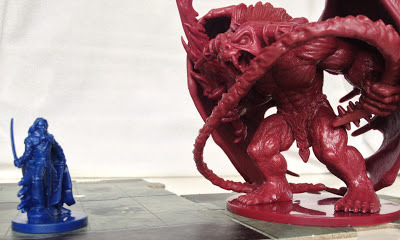 The miniatures are all rather fine sculpts and very good quality for a board game, an area which is usually the ugly step child of the miniatures market. They are however, made from a material that can best be described as gumby. The plastic used to make the minis is very soft and the models have been crammed in the box, this means that some of the minis have trouble surviving in such cramped conditions. None of my miniatures where broken but they did have their fair share of bent swords and warped wings. That's one hefty box of bling! 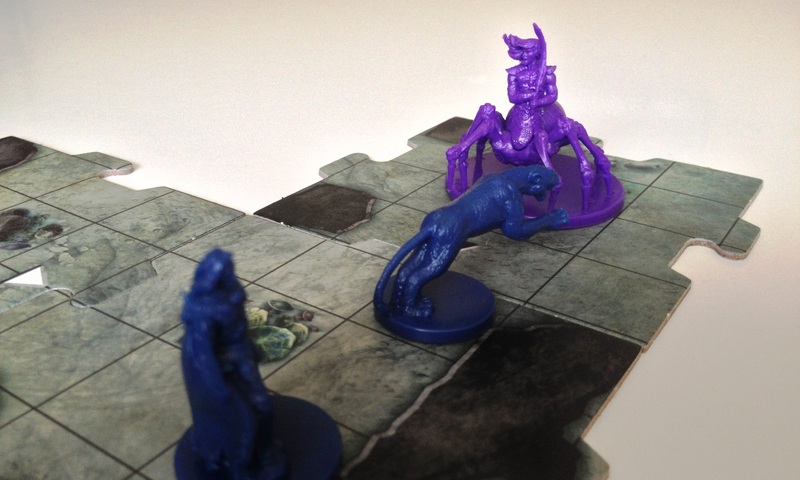 The game has a rather simple set of rules, which make the game easy to pick up, as long someone who already knows how to play is teaching you as The Legend of Drizzt is another entry into the rulebook hall of shame. It’s not the worst rulebook ever but it does struggle to convey a very simple rule set. Once past this hurdle it’s obvious that Drizzt is an uncomplicated game to play, and if you’ve ever had any experience with any incarnation of Dungeons and Dragons you’ll soon be holding that d20 like an old friend. Some of the miniatures are very good for a board game. 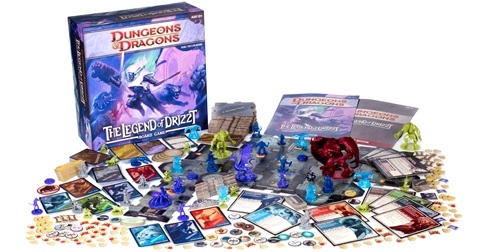 To play one of The Legend of Drizzt’s 12 scenarios you generally shuffle up a deck of dungeon tiles, placing a special trigger tile at a specific point, then place your heroes on the starting tile ready to explore the Underdark. 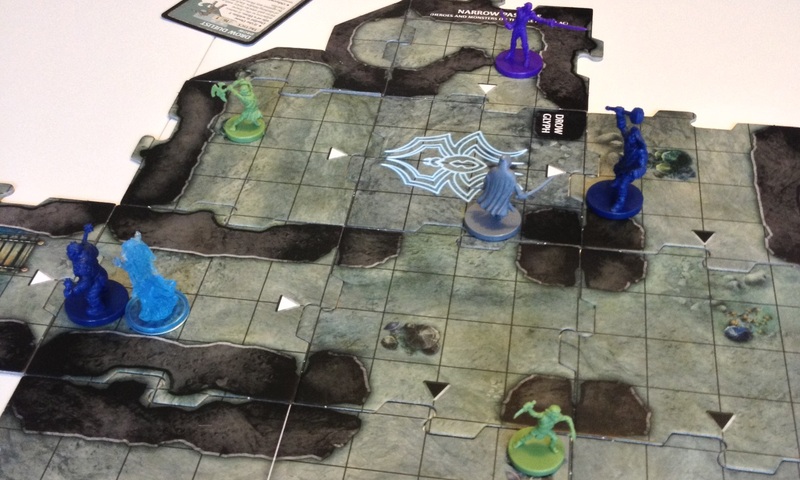 Each turn the heroes have the opportunity to explore one of the open tile edges therefore expanding the dungeon. A random monster is placed on every new tile, and if a hero didn’t go exploring, or is just unlucky, they get to take a random event card. These random event cards are usually bad news, causing a small amount of damage to the hero who picked the card. The monsters then get a chance to hit our heroes and then it’s on to the next hero. Slowly but surely the Underdark is expanded, caverns are unearthed, narrow passages, deep chasms and spider queen lairs are discovered and then the heroes will find the quest related tile and the coda of this piece kicks off. It’s at this point that the true individuality of the scenario makes itself clear. Up until now the majority of scenarios run the same but the final tile will outline the win or lose conditions for your band of heroes. It could be stealing a crown, it could be escaping the Underdark with your lives or it could simply be killing the final monster. This final monster takes the form of a special character, usually a Drow of some kind, who’s only aim is to kill your heroes. Their stats and abilities are more similar to the heroes than the monsters they faced so far and are always much more challenging. The random cavern tiles mean that every dungeon is different. It doesn’t take long for the game to devolve into a repetitive rhythm. Move to a tile edge, peer inside, unveil the monster, get damaged by the monster, get damaged by random event card, kill the monster, grab the treasure and then move to the next tile edge. This process repeats until the end game is revealed, complete the quest then everyone is home in time for tea. It’s unfortunately then it dawns on you; this game is a co-op version of Munchkin; kick down the door, kill the monster, gain the loot, rinse and repeat. Munchkin is ridiculing those old roleplaying game clichés and well Dungeons and Dragons is nearly 40 years old and it has come full circle and turned into the very think Munchkin is mocking it for. You can't have Drow without Driders. Your heroes get hit for damage almost every turn, whether it’s because of the monster hitting first or due to one of the random event cards that generally cause unblockable damage. It makes the game a race; can you find the final tile before you all die? But this constant damage often feels cruel as there’s little you can do to prevent it. This relentless random damage also means there’s little incentive to hold back and conserve hit points, often the only strategy is to run through the caverns as quickly as possible. It also doesn’t help that the scenarios are all very similar. 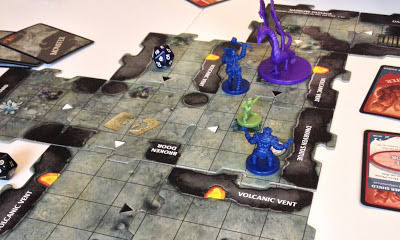 There are the odd stand-out adventures, such as one where heroes have to close fissures in the caverns but generally you feel that if you’ve played one scenario you’ve played them all. The repetitive structure of The Legend of Drizzt wouldn’t be so bad if you felt you had much in the way of tactics or control. 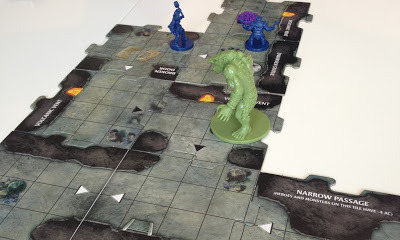 This being a cooperative game means the monsters follow a simple form of artificial intelligence, which generally falls into move towards hero then hit hero. Every so often it throws in something interesting like teleporting vampires or cowardly goblins that won’t attack unless they’re far enough away. Keep your party together and you’ll generally just smack everything that stands in your way and hope you have enough health left to fight the final boss. That’s not to say the game is completely without tactics, the boss characters especially can result in you having you to use your nonce to beat them, it’s just unfortunate that this just becomes carefully positioning your heroes to correctly pull the boss in the right direction. It feels like aggro-ing a monster in World of Warcraft. That chap in grey is one of the boss monsters and our foolish heroes have got themselves split up. Maybe I’m seeing this all wrong though; maybe this game isn’t aimed at me. Maybe the 10 year old who gleefully ripped the wrapping paper off Heroquest one Christmas morn is the exact person who this game is aimed at. Maybe I shouldn’t even be looking at this game and should instead be digging into something heavier like Fantasy Flight Games’ Descent series. Or maybe, just maybe I should just man up, ditch these board game shenanigans and break out some proper dungeon crawling like Pathfinder or the real Dungeons and Dragons roleplaying game. Either way I can’t help but think that The Legend of Drizzt is just too light a game; there’s no meat on the bone, no substance and consequently it leaves me unsatisfied. It’s entertaining in short bursts and the cooperative nature means at least you’ll have a good group experience but for a product that retails at quite a hefty price point it doesn’t pack enough punch to make it a worthy purchase.